Wonder why your auto rates are going up??? These statistics give us a pretty good picture as to why we see our auto rates go up. More cars on the road make for more of a chance of an accident. 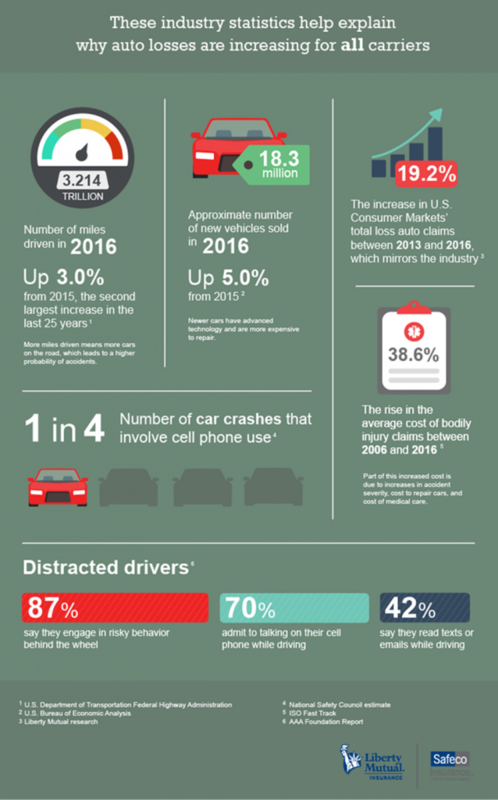 Since buying a car is more expensive than ever and they have so much technology built into them, the cost to repair them goes up as well. Let’s also talk about the medical cost associated with accidents. We all know that health care is expensive. Just going to the doctor can cost you an arm and a leg. Well, if Insurance companies are paying 38.6% more in bodily injury claims, it stand to reason that insurance premiums are going to go up. All this and we haven’t even touched on the hottest topic, distracted driving. Everybody’s so busy and multitask these days. Driving should be the ONE thing you do with all of your attention focused on one thing–DRIVING. The numbers on the infographic speak for themselves. It’s only getting worse. There are insurance companies out there that offer what is called telematics. It is a device that you install in your auto and it can monitor your driving for a period of time to give you a personalized auto insurance rate. One of the positive things that come from being monitored, is that you become aware of some of your driving habits. You might not even be aware that you have a tendency to break hard. Is that because you weren’t paying attention to what’s in front of you? The next time you’re behind the wheel, practice defensive driving and keep your eyes on the road.